Information on transmission codes and VIN stamps is located on the drivetrain decoding page. The Powerglide, RPO M35, was the optional 2-speed automatic transmission for the Camaro. It was available on all first-generation Camaro models except the SS396 and the Z28. It was a popular option in 1967-68 since it was the only automatic available for L6 and small-block V8 cars (Z28 and a few very-late 68 TH350 experimental builds excepted). Its usage decreased significantly with the introduction of the TH350 3-speed automatic in 1969. It is a reliable, smooth transmission and capable of very respectable performance. The Powerglide in "built" form was the preferred drag-race transmission for quite a few years, and is still popular for drag racing. In 68-69, there was a low cost version of the Powerglide, RPO MB1, that was marketed as the Torque-Drive. The Torque-Drive had a manual shift valve body and was approximately $100 cheaper than the Powerglide. It was only available with 6-cylinder engines. The TH350 3-speed automatic transmission wasn't officially offered as an option (RPO) until 1969, although some late 1968 327/275hp Camaros did receive it as part of an internal GM test fleet. The 68 test fleet cars have a unique engine suffix code, EN, and the TH350 should have a date stamp that corresponds to the build date of the car. When the TH350 was released in 1969, it outsold the Powerglide 78,849 units to 66,423. Like the Powerglide, it was only available with 6-cylinder and small block V8 (Z28 excepted) cars, as the Camaro big-block engines had too much torque for the TH350. The transmission model number comes from the nominal torque rating, 350 lb-ft of torque. The TH400 3-speed automatic transmission first appeared on GM passenger cars in 1965. For first-generation Camaros, it was only available in, and was the only automatic transmission for, big-block V8 engines. In 67 and 68, it was limited to the L35 325 hp and L34 350 hp engines. In 69, the TH400 was also available with the 396 and 427 solid lifter engines. The model number comes from the nominal transmission torque capacity, 400 lb-ft of torque. There were two 3-speed manual transmission options available in the 67-69 Camaros. The base manual transmission for non-high-performance models and 67-8 SS350's was the Saginaw 3-speed, M15. If no transmission option was selected, this was the transmission installed. It was column shifted unless a console or RPO M11 floor shift was selected. An exception to this was SS350's, which required the HD 3-speed to get a floor shift. The heavy-duty 3-speed manual transmission, made by Borg-Warner, was available as RPO M13 for 67-68 SS models. For SS350 models, M13 was optional (but required if you wanted a floor shift). For SS396 models, M13 was a required option if another transmission was not ordered. In 1969, the heavy-duty 3-speed was supplied by Muncie and changed to RPO MC1. It was available on LM1 and SS models. For the LM1, it was a required option if another transmission was not ordered. For 69 SS models, the HD 3-speed trans was included in the SS package. M20 was the generic RPO for a 4-speed transmission. For lower performance applications (L6, 307, 327, and L65 350), the Saginaw 4-speed was utilized. It used a cast iron case. For higher performance applications (LM1 350, SS350, big blocks, and Z28) the Muncie 4-speed was used. It used an aluminum case and different gear ratios from the Saginaw 4-speed. The wide-ratio Muncie 4-speed transmission was marketed under RPO M20. The close-ratio version of the Muncie 4-speed was RPO M21 and the heavy-duty close-ratio 4-speed was RPO M22. The wide-ratio Muncie M20 was available with any of the high-performance engines, except the L78 and Z28 in 67 only came with the M21. The M20 was the only 4-speed available with the SS350 and the SS396/325 hp (L35) engines. The close-ratio M21 was available only with the SS396/350 hp (L34) engine and the solid lifter engines (Z28, L78, and COPO). The heavy-duty M22 was limited to just the solid-lifter engines, starting in Camaros in 1968. The Muncie usages are also shown on the ID tables (e.g. the 69 ID table). # Some late-production 69 Camaros came with Muncie 3925661 maincases. * The 1970 M22 used in 454 Chevelles used the 1971-74 output shaft. C = 2.20:1 HD Close Ratio (M22), aka "Rockcrusher"
The transmission code is normally located on the passenger side of the transmission, arranged vertically just in front of the tailhousing joint. See the transmission decoding information for pictures and more information. If the input shaft is visible, the number of circumferential grooves on the input shaft will also generally indicate the Muncie type. Be careful, as 1963-65 M20 Muncies are like later M22s in that they have no input shaft grooves. However, the early M20 has only a 7/8-inch diameter cluster pin, while the M22 has a 1-inch pin. Service replacement input shafts also will have no grooves. To distinguish an early (pre-suffix) M22 from the other Muncies when the transmission is on a car, note that all M22s had the lower, forward, passenger-side maincase boss drilled and tapped for a magnetic drain plug. This wasn't done (by the factory) for M20/M21 until 1970. While this boss could be drilled for a plug on a M20 after it left the factory - if the boss is undrilled, then the case definitely was not part of a M22. The M22 gears have a shallower mesh angle to reduce thrust load and heat. 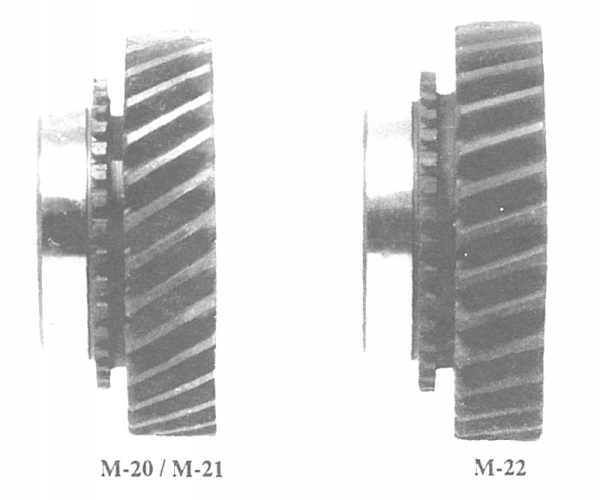 If the gearbox cover is removed, the difference in the angle between the M22 gears and the gear angle used in the other Muncies is discernable. Note in the photo below that on the M20/M21 the bottom of the next tooth starts below the top of the preceding tooth (i.e., they overlap), whereas on the M22 the angle is such that the teeth actually have a small gap between the top of one tooth and the bottom of the next. The shallower mesh angle of the M22 causes a "whine" noise in 1st, 2nd, and 3rd gears and the sound is the reason for the popular nickname for this transmission, the "Rockcrusher." The lower angle increases the load carrying capacity of the gears at the expense of the increased noise. The reason for absence of the noise in 4th gear is that 4th is a direct output from the input (1:1 ratio), and there are no significant gears involved. For additional details on other transmission component casting numbers, component casting dates, and internal transmission details, see Colvin's Chevrolet By The Numbers series, listed in the CRG References. See the Manual Transmission Floor Shifters article for detailed shifter information. All 1967-69 Camaro 3-speed transmissions transmissions used Muncie shifters. 1967-68 Camaro 4-speed transmissions (Saginaw transmissions as well as Muncie) also used Muncie shifters. The stock Muncie shifter was mounted by a bracket to the transmission crossmember and further supported by a longitudinal stabilizer. This caused problems in performance applications due to the transmission twisting under load and binding the shifter levers - causing many a missed shift. The stock Muncie 4-speed shifter was often replaced by the aftermarket Hurst Competition-Plus shifter. The Hurst shifter mounts directly to the transmission housing, instead of the transmission crossmember, which eliminates the shifter binding issue. The 67-68 Hurst aftermarket bracket used U-bolt around the tailhousing. The Muncie shifter in 1967 was generally stamped "MUNCIE" on the handle, though some shifters have unmarked handles. The Muncie shifter on the Saginaw was not stamped, while the Muncie shifter on the Muncie transmission was generally stamped "MUNCIE". There are known exceptions to this rule though. Slip-in "bayonet" style round handle (stamped 5325) instead of bolt-on square handle. OEM 69 shifters used molded rubber bushings for the rod ends. Aftermarket Hurst shifters used nylon or bronze bushings. Rebuilt or reproduction shifters use the 1970+ rubber insert bushings. Small-block and big-block cars each used unique shifter mounting plates bolted to the tailhousing. The aftermarket Hurst bracket bolted to the tailhousing, but was the same for both small-block and big-block. All shifter knobs were a 2-piece ball: the top 2/3 was black, with the shift pattern printed in white; the bottom 1/3 was chromed and included a threaded locking ring. With a console, the shifter knob was a chrome ball without a pattern. Without the console, the shifter knob was a 2-piece ball: the top 2/3 was black, with the shift pattern printed in white; the bottom 1/3 was chromed and included a threaded locking ring. In 1969 the size of the attach thread was changed from 5/16-inch diameter to 3/8-inch diameter. All 1967-69 six-cylinder and small block engines use the same transmission crossmember. The crossmember opening is oval and the transmission mounting holes are centered (side to side) on the crossmember. The BB manual transmission crossmember looks similar to the SB version, but the BB crossmember opening is squared-off with a beveled corner whereas the SB opening is oval (see picture). The transmission mounting slots for the BB manual trans crossmember are also in a different location than the SB version. The slots are offset about 1/2 inch towards the passenger side and about 3/4 inch forward. The crossmember used by the 67-68 Firebird looks very similar to the BB crossmember. It has a squared-off opening with a beveled corner like the the BB crossmember, but the trans mounting slots are centered side-to-side (see sketch). 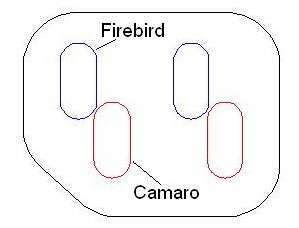 The 69 Firebird used a one-piece crossmember. 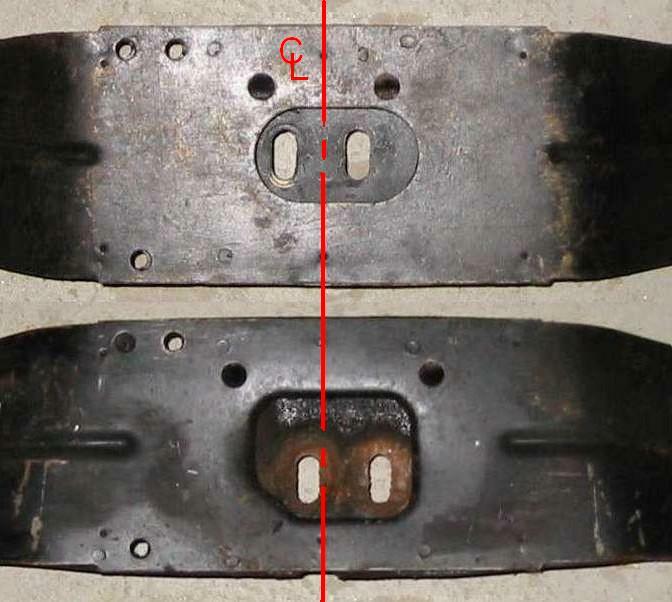 It was basically just the upper part of a 67-68 Firebird crossmember (i.e. it is missing the bottom part with the opening). The TH400 crossmember is different from the other crossmembers in that it is formed from tubing. The Camaro TH400 crossmember has the mounting plate welded about 1/2 inch off-center. The Firebird TH400 crossmember is also made from tubing and looks very similar, but the mounting plate is centered. 67-69 BB manual trans          1/2"
The following system will be used to identify service engine and transmission assemblies* including replacement parts. Manufacturing plants will number each assembly as it is produced. The first letter will designate the GM division which produced the engine. Example: Number CE900175 designates Chevrolet engine - 1969 year, and the 175th unit produced for service at the Flint Motor Plant (L6). Hydra-Matic transmissions will be numbered with the letter "H"
regardless of the G.M. Division using the transmission. * This numbering system applies to service engine assemblies, partial engines, fitted cylinder cases, cylinder cases, transmission assemblies and transmission cases. Most service parts were produced specifically for service. Production engines and transmissions were generally not used as service parts. The M20 4-speed, standard transmission, RPO was a generic category. It was translated at the factory into a low-performance Saginaw when teamed with the L6 engine, as the higher-performance Saginaw in the lower-end V8s, and as a Muncie in higher-performance V8s such as in the SS and Z28 models. The line between low-performance and high-performance blurred with time. The 1967-68 275HP L30 engine received the Saginaw while the 1969 255HP LM1 engine received the Muncie. The 250 hp L65 replaced the LM1 mid-year in 69 and it received the Saginaw. The M40 3-speed, automatic transmission, RPO was also a generic category in 1969. It was translated at the factory into the TH350 (actually RPO M38) for non-big-block engines, and into the TH400 for big-block engines. The base 3-speed standard transmission for the SS350 in 1967-68 was the 3-speed, column-shift, Saginaw. And it was only available in the column-shift. If a floor-shifted 3-speed was desired, the M13 HD three-speed, available only in floor-shift, was a separate option. The base SS350 (and LM1) 3-speed was changed to the floor-shifted HD version in 1969 - the column shift standard transmission was no longer available in the SS or LM1 cars. The HD three-speed standard transmission was RPO M13 in 1967-68 (manufactured by Borg-Warner), but was MC1 (manufactured by Muncie) in 1969. The MB1 "Torque-Drive" two-speed transmission was only available for the L6 engines, and only in 68-69.